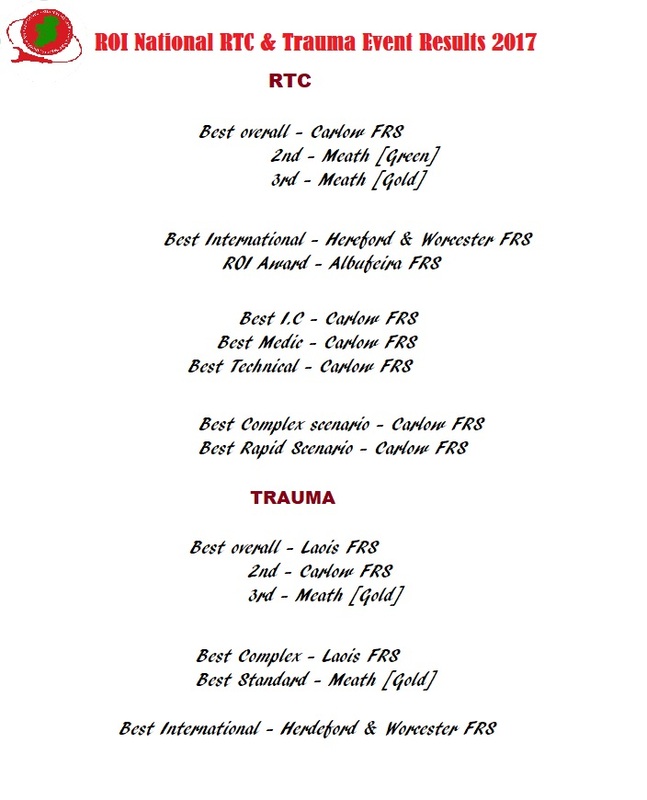 Fire and Rescue Teams from Ireland performed best at the National RTC Trauma and Extrication Challenge 2017, held in Navan, Co. Meath last week. 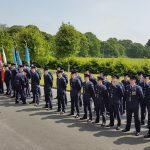 Among the Irish participants were Fire & Rescue teams from counties Meath, Carlow, Laois and Wicklow while the Gardaí, Civil Defence and Tara Mines also entered teams into the challenge; with teams from counties Carlow, Meath and Laois scoring the highest. Overall, twelve teams participated in a range of challenges under two sections; (Extrication and Trauma) in three stages; (Standard, Rapid and Complex), with the International teams consisted of teams from Hereford & Worchester Fire & Rescue Service in the UK and Barcelona in Spain, Albufeira in Portugal. 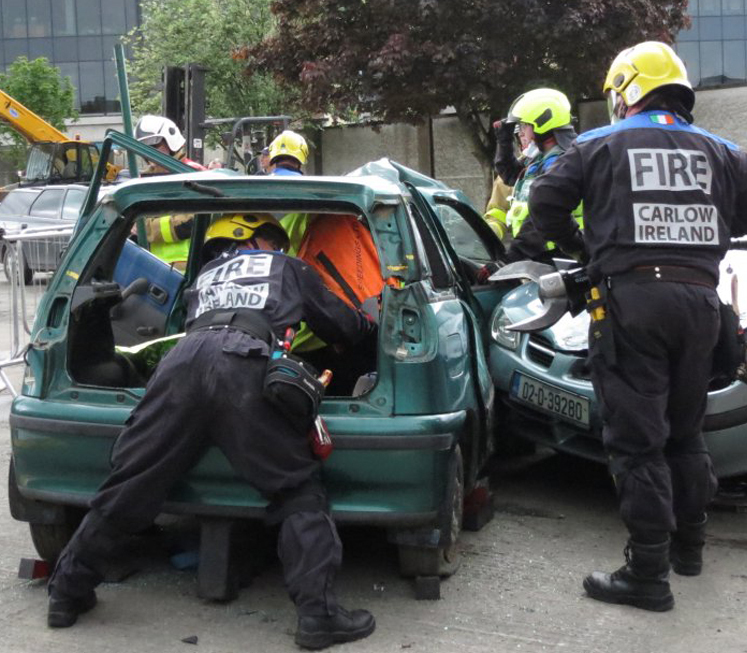 The challenge event saw the Irish and International Fire & Emergency Services teams take part in Road Traffic Collision extrication scenarios and Trauma Rescue simulations all day. 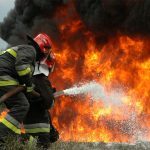 The aim of the Challenge Event is to promote best practice / casualty-centred training / safe and efficient rescues & care among Emergency Service professionals in a competitive training environment. This annual event follows the same competition format and best practice protocols as developed by the World Rescue Organisation [WRO]. The top teams from the day will have the opportunity of representing Ireland at the World Rescue Challenge 2017. 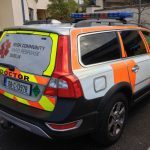 The RTC Trauma and Extrication Challenge is organised by the Rescue Organisation Ireland (ROI) which was established in 2008 and held their first ROI challenge in Dublin in 2009. 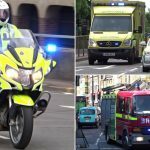 The ROI began this challenge in Ireland in response to the high levels of fatalities and incidents on our roads, and while the whole concept of rescue challenges has been around for approximately 20 or 30 years, Ireland has always included an international dimension to it. The day ended with a Post Challenge Meal and Awards Ceremony at the Knightsbrook Hotel in Trim. 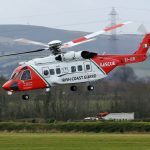 There are some great photos of the day over on the Rescue Organisation Ireland website.